70" x 17" x 10"
"The Push & Climb" is simultaneously a figurative self-portrait, a ladder, and a wheelbarrow of sorts. When pushed, it physically simulates the feeling of traveling down a bumpy road; the bumps, however, are not necessarily in the road, but in the piece's offset wheel, the "head" of the figure. It is a metaphor for the mental or emotional journey of someone who has chosen a "hard road", not necessarily for the end reward, but for the process and experience. "The Push & Climb" takes structural cues from animal skeletons rather than from typical wood construction. The wood was sawn following the natural grain lines of the oak to mimic a hand-drawn line. The curves of the wheel are steam bent. 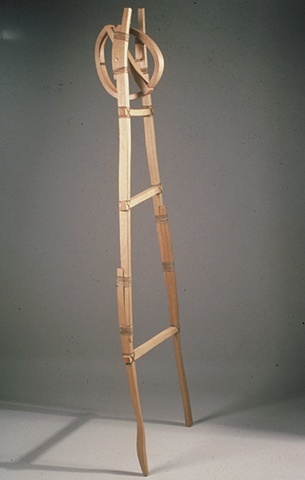 The frame is held together by lap joints and rawhide lashings. Working without straight lines, fixed joints or glue, a natural asymmetry developed, like bones of a skeleton held together by flexible tendons that rack under gravity to stand askew.